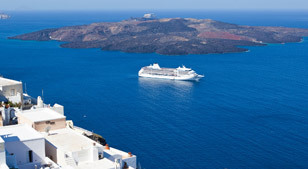 Enjoy complimentary Gratuities, Pre-Cruise Hotel, Beverages (including fine wines and spirits), Roundtrip Air…and more! The Regent Seven Seas fleet is all-suite, with 97% of staterooms having a balcony! Regent Seven Seas sails to many destinations across the globe… you can even see all of them at once on a World Cruise! Massages, Manicures, Acupuncture, and many more luxurious treatments are available in the world-class spa aboard each Regent ship. Topics covered include Food, Wine, & Spirits, Fine Arts, Discover & Exploration, and many more! 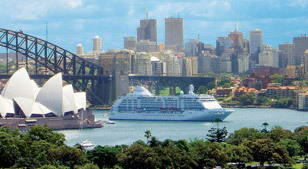 Low Price Guarantee on all Regent Seven Seas Cruises! Book any Regent Seven Seas cruise with us and you'll get the best deal possible, regardless of the ship or sail date! 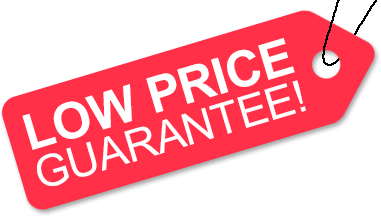 Because of our "Low Price Guarantee," nobody beats our Regent cruise prices, so look around and you're sure to find the best RSSC cruise deal possible when booking with us! Get an Onboard Credit or Cash Back when you book a Regent Seven Seas cruise with us. The value depends on the particular cruise and accommodations you book. Values are listed on Step 3 of the online booking process. Call-In Sale: Limited Time Savings! ♦ Limited time savings too good to list online! Offer valid only for new bookings made on or after March 4, 2019 for select 2019 Seven Seas Mariner Alaska voyages only. Offer applies to booking a Deluxe Veranda through Horizon View Suite only (category HS - H). Offer is capacity controlled, subject to availability and may be withdrawn without notice. Additional restrictions may apply. We reserve the right to correct errors. ♦ Up to a 3-Catgory Upgrade PLUS $250 Onboard Credit w/ FREE Pre- or Post-Cruise Land Program on select voyages! Offer is capacity-controlled and valid only for new bookings made beginning 4/1/19 by residents of US and Canada only. Offer applies to booking a Suite only. Offer is subject to availability and may be withdrawn without notice. Additional restrictions may apply. We reserve the right to correct errors. We do not charge booking fees on any cruises! You're sure to enjoy an affordable Regent Seven Seas cruise when booking with us! Our special offers on Regent Seven Seas Cruises may not be combinable. Certain restrictions apply to each offer. Regent Seven Seas Cruises (also known as RSSC, or simply just Regent) does not just provide their guests with cruises, they help to define what luxury at sea should be. Regent's ships are filled with a gracious and attentive staff whose goal is to fulfill your desires and wildest dreams while you're on their all-inclusive cruises. What really helps to set Regent apart from their competition is the unique cruise itineraries that they're able to offer their (typically veteran) guests. With their mid- to small-sized ships Regent is able to avoid the very busy ports of call that many other cruise lines are limited to, and take the less-traveled routes to visit exotic ports of call. Regent Seven Seas' ships sail all around the world. among the many destinations featured on their cruises are Alaska, Africa, Europe, the Caribbean, the South Pacific, Central America and even Antarctica. For those with more time on their hands to enjoy true luxury, Regent offers a world cruise itinerary. While on a Regent Seven Seas cruise you'll be able to enjoy fine dining in their gourmet restaurants (some of which feature Le Cordon Bleu® cuisine), with a casual open-seating style. Their cruises are even further enhanced by the luxurious accommodations available in their all-suite ships. The excellent staff-to-guest ratio on each Regent ship means that their guests don't have to look far for assistance from a more than capable staff member. American Discount Cruises & Travel is proud to offer the best deals possible on all Regent Seven Seas cruises booked with us. Backed by our "Low Price Guarantee," and powered by our team of expert travel agents, we're sure to exceed your expectations when booking your next Regent Seven Seas cruise! Gratuities, round trip Economy airfare, and beverages (including select wines and spirits) are included in the fare of all Regent cruises. Also included with each Regent cruise is complimentary 24-hour room service, an in-suite bar setup, and in-suite dining. Category B suites, and above, get complimentary butler service as well. 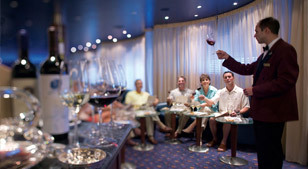 Regent Seven Seas Cruises features a wonderful variety of enrichment programs on each of their ships. Among these great programs is their Featured Luminaries, which features special guests and events that include lectures by world-renowned experts and award-winning luminaries in their field. Regent's Food, Wine & Spirits program features a Le Cordon Bleu Workshop, a Spotlight on Chocolate, a Spotlight on Wine, and much more. 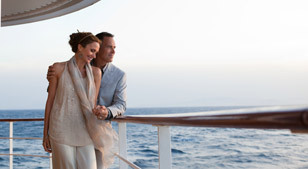 Regent Seven Seas Cruises offers a selection of FREE Unlimited Shore Excursions on each and every voyage. Receive access to complimentary, award-winning shore excursions during your voyage, in addition to the all-inclusive cruise experience you have come to expect from Regent. For those looking for even more, Regent Seven Seas' personalized itineraries allow guests to customize a voyage (at an additional cost) that is truly their own, offering intimate encounters at each port of call. Private Arrangements can even personally acquaint you with one of their expert guides in a unique, one-on-one expedition. They enlighten each exclusive tour with insights into the hidden treasures and gems of each area. What's New for Regent Seven Seas? Regent has announced the commission of a sister ship to Seven Seas Explorer, to be launched in 2020, called Seven Seas Splendor. This upcoming vessel with share many of the amenities of Seven Seas Explorer with a twist, such as a new rendition of the Regent Suite (debuting on Explorer). In December 2016, Regent announced the first of its itineraries departing for Havana, Cuba. Seven Seas Mariner will offer two voyages departing roundtrip from Miami in April 2017, both of which include an overnight stay in Cuba's capital city. Seven Seas Explorer was christened July 13, 2016 in Monaco. Princess Charlene of Monaco, Explorer's chosen godmother, did the honors during a ceremony that included a mini-opera concert. Seven Seas Explorer's inaugural voyage officially departed July 20, 2016. Regent Seven Seas has recently announced that it has commissioned a 54,000-gross-ton ship to be built by Italian shipyard Fincantieri. This new ship, named Seven Seas Explorer, will be the largest in the Regent Seven Seas fleet, carrying 750 guests in all-suite, all-balcony accommodations. Seven Seas Explorer will launch in 2016 and will have many of the features that makes Regent Seven Seas one of the world's leading luxury cruise lines. Although the ship will be 12.5% larger than Regent's biggest ship, it will carry only 7% more passengers. 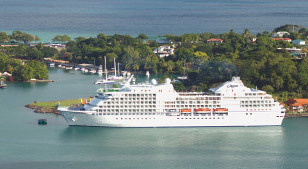 Seven Seas Mariner went through a multi-million dollar refurbishment in 2014. The ship's decor was upgraded with a fresh, elegant, and luxurious new look. The two-deck high theater was renovated, as well as the Stars Lounge, Horizon Lounge, and Observation Lounge. The Canyon Ranch Spa received upgrades including new steam rooms, new stone flooring, and new equipment in the fitness center. The Pool Deck also received new sofas, chairs, and lounges. Regent Seven Seas Cruises was voted the world's best cruise line in the "large-ship" category in the 2010 Condé Nast Traveler readers' poll. Travel + Leisure magazine readers also ranked Regent Seven Seas among the "Top 10 Large-Ship Cruise Lines" in the world in their 15th annual Word's Best survey. Seven Seas Explorer - NEW SHIP! Seven Seas Mariner - REFURBISHED! Seven Seas Splendor - NEW SHIP! Click a price below to view the Regent Seven Seas cruises available during that month in that destination. Note: Content shown in videos is subject to change as time passes from when the videos were filmed. With the exception of the initial introduction and the ending of each video (where our logo is shown), these videos were not produced by our company, and we hold no liability if any information shown is inaccurate.